It is generally accepted that our diets play a huge part in our overall physical fitness and health. But have you ever considered the possibility that the food you eat can also affect your mental health and mood? Although experts believe that clinical depression and other mood disorders cannot be cured by diet alone, they do advise certain food types, nutrients and eating habits in general can act as a natural aid alongside medication to help ease symptoms of depression and anxiety. After all you are what you eat, so getting a healthy, well balanced diet will make you feel healthy and happy too. Here are some of the nutrients that can make up a happy diet and help aid recovery for depression or simply just boost your mood. Free radical cells are responsible for a number of health issues, some of which can lead to serious diseases such as cancer and heart disease occurring. Free radicals can be caused by inhaling the harmful compounds from pollution or simply unexplained malfunctions in the body. They can also have a very detrimental effect on the brain’s functioning and contribute to causing mental-health problems such as depression to occur. Antioxidants found in types of vitamins can help fend off these free radical cells and protect your mind and body from their harmful effects. They can also help boost the immune system keeping you fighting fit from other bugs and infections too. Antioxidants can be found in a number of foods but they are most powerful in brightly coloured fruit and vegetables with high Vitamin C content such as broccoli, orange, peppers and berries. They are particularly potent in strawberries and blueberries which are being hailed as new ‘super foods’ due to the sheer amount of goodness in such small berries. One of the key reasons for irregular mood is irregular energy levels caused by irregular blood sugar. When you are running on caffeine or sugary highs you will find yourself feeling pumped up and full of energy one minute and lethargic and irritable the next. This rapid change isn’t good for your general health or your mood. Certain food types have simple molecular make ups which means the body breaks them down quickly and uses up the energy they provide quickly too. Try and adapt complex carbohydrates into your diet as these have a much more intricate make up which takes the body a lot longer to metabolize, thus leaving you with more regular and long lasting energy. With fatigue being one of the key symptoms in depression and low mood, feeling energized and ready to go is a great way to improve mood. Complex carbohydrates can be found in wholegrains such as brown rice, pasta, cereals and bread and also in a variety of vegetables. Fact: Complex carbohydrates are generally less fattening than their simple counterparts and leave you feeling fuller for longer due to their high fibre content. This means that a diet rich in complex carbs can also help you maintain a healthy weight as well as improving your mood. Foods high in protein contain a substance called tryptophan. When absorbed by the body this substance is transformed into serotonin – otherwise known as the happy hormone. This will make you feel more alert, calm and focused as well as providing you with more energy. It is also great for boosting the immune system and helping the body to fight off any ailments which may also bring your mood down. Protein can be found in a range of food types including dairy, fish, beans and poultry. It is also particularly high in bananas. Fact: Whey protein is very potent in the tryptophan compound. Although you should try and get protein from your diet, you can buy whey protein in powder form and incorporate it into your meals either by stirring it into a stew, adding it to smoothies or even mixing it into a cake or bread mix. Although research is ongoing, experts believe that there is a clear link between Vitamin D and depression and those deficient in the vitamin are more susceptible to suffering from mental disorders. The reason for this isn’t fully understood but it is known that Vitamin D is vital in brain development. For this reason you should try and keep your levels of Vitamin D high through consuming full fat dairy products, red meat and some fish. It is worth noting that many foods rich in Vitamin D are generally quite fattening and for this reason experts are unsure just how much to recommend in dietary form. You can also add Vitamin D to your diet through supplements (although always speak to a healthcare provider first) or through a stroll in a sun. That’s right, the key source of Vitamin D is through natural sunlight. Fact: A brisk walk in the sunlight can really be the ultimate mood enhancer. Not only are you elevating your levels of Vitamin D but you are also pumping blood around the body, improving oxygen levels and getting feel-good hormones circulating. Getting the key nutrients is important in elevating mood but so are your eating habits in general. You need to ensure that you eat regularly to avoid blood sugar levels dropping and also ensure that you drink a lot of water throughout the day. Becoming dehydrated is a sure fire way to lead to fatigue and irritability and it can be very dangerous. Try to ensure that the food you eat means you can maintain a healthy weight. Being overweight can put extra pressure on vital organs and make you feel sluggish and tired. Combat this through regular exercise and healthy eating. Fact: When it comes to drinking a lot, don’t assume that anything in liquid form will keep you hydrated. High caffeine drinks such as coffee, alcohol and some fizzy drinks actually act as a diuretic meaning that it makes your urinate more and this leads to dehydration occurring. They also tend to produce anxiety-like symptoms such as a rapid heart rate, followed by depression-like symptoms such as low energy dips. Practice Point: Check out Strategy 18 in The Coping Kete for ideas to help turn the Good Mood Food information into part of your daily practice. About the Author: Claire Sexton is a freelance writer and full-time mom with experience of supporting people she cares about through the experience of depression. This gave Sexton an interest in mental health in general. After graduating college, she put a lot of effort into her career as a nutritionist, but when motherhood came along, she decided it was time to pull back and take up her other passion, writing. Now she writes about health and finds her work-life balance far more enjoyable. When not working and caring for her children, she likes to go for long walks and find ways to make family meals more exciting. 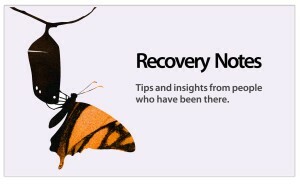 Recovery Notes is an Engage Aotearoa project that asks people to share the top five tips and insights they have learned from or about their personal experiences of mental-health recovery or being a supporter.